The third series of The Eighth Doctor Adventures has been nothing if not entirely willing to embrace the sheer diversity and scope of genres and tones that Doctor Who is intrinsically set up to explore, and Jonathan Morris deftly continues that trend with ‘The Cannibalists,’ a story populated entirely by rather unique robots. When the Doctor and Lucie arrive on the Haven that is otherwise devoid of organic life and where the Assemblers await the return of humans, they soon find that the lower levels of the star city are much less welcoming to their presence. Taken completely on its own, ‘The Cannibalists’ is hardly the most imaginative script, but the fact that the characters experiencing distinctly human emotions and actions are instead robots does add a unique twist. Indeed, the notion of the robots endlessly carrying on with their tasks while waiting for humans to arrive paints a sadly poignant picture, and the unexpected ability of the maintenance drones to override their programming when they began to malfunction provides adequate explanation for why these robots are as they are. With the Cannibalists and Death Metal Gang forcefully taking apart still-functioning robots, the Assemblers building the drones, and the unique Servo expressing himself through poetry, the Haven is filled with intriguing subgroups that help the city come to life meaningfully. Of course, as in the very best of Doctor Who traditions, the story is not quite as simple as a population of odd robots may initially suggest. Instead, the powerful Min’s ability to erase the minds of every robot in the city slowly comes to the forefront, and the fact that the robots have hit the reset switch so many times before, slowly feeding into the problem at hand as the drones continue to rebel and turn into sociopaths, is a fitting twist. This is heart-wrenchingly buoyed by the fact that the entirety of Haven was deemed to be in excess of requirements and that humans infected it with a virus with the intention of causing the robots to self-destruct. Strangely, the Doctor and Lucie take on more of a passive background role than is typical for this series, though this does not stop Paul McGann from imbuing impassioned menace into confrontational scenes and Sheridan Smith from again exuding the terrific emotional and physical stress that Lucie continues to experience. Although most of the supporting performances do blend together to the point that many of the robots are ultimately indistinguishable, Phil Jupitus and Phil Davies in their respective roles of the distinguished Servo and the malicious Titus give truly standout performances that make these two rich characters regardless of their inorganic status. 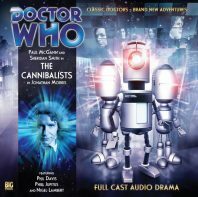 So although ‘The Cannibalists’ relies on the robotic nature of its characters to elevate what is ultimately a straightforward story, the end result is very much an enjoyable one that makes the most of its superb sound design that brings to life the overwhelming mechanical environment. With a strong blend of humour and genuine emotion amidst the frequent running from place to place that pervades its running time, ‘The Cannibalists’ is certainly a success as the series continues to explore eclectic settings and tones, but it’s also perhaps one that will not remain in the lasting consciousness long after it has finished.